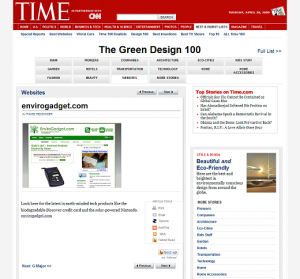 EnviroGadget.com has been listed in Time Magazine’s The Green Design 100, which is a list of the top 100 people, companies and organisations that contribute to sustainable and eco-friendly design. EnviroGadget.com was mentioned in the Websites section with 10 other websites, such as Inhabitat, Greenzer, and a few others. I’d like to thank Time Magazine for the mention, it’s a huge compliment to have been nominated! Cheers Simon. As you could imagine, I was pretty chuffed!